Global Question is in Hong Kong to discuss China and its place in the world in 2019. 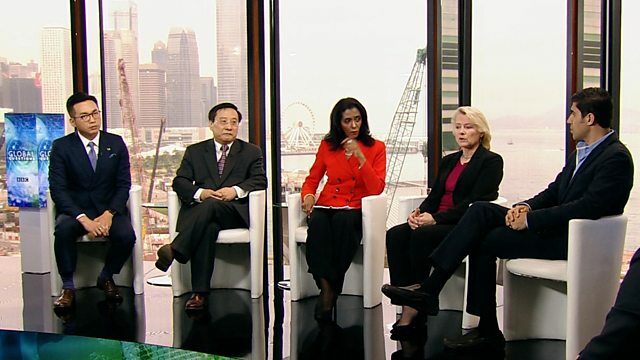 Global Question travels to Hong Kong to discuss China and its place in the world in 2019. China’s extraordinary economic boom is finally cooling. And it’s locked into a damaging trade war with the United States. Is the Chinese economic miracle grinding to a halt? If so, what will be the impact on the global economy? Could it even trigger another financial crisis? What do China’s slowing growth rate, high debt levels and struggling currency mean for the daily lives of its one billion people, and for those in Hong Kong and around the rest of the world? Susan Thornton - Former US Assistant Secretary of State for East Asian and Pacific Affairs. Victor Gao - Vice-President of Centre for China and Globalisation in Beijing. Parag Khanna - Asia Analyst and Founder of FutureMap. Global Questions is broadcast on TV and radio. Find details on the TV version here.